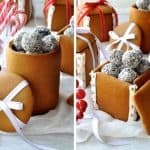 A completely edible Christmas gift – Gingerbread Boxes and Mason Jars! The Mason Jar is made simply by wrapping dough around a can! You don’t need any cookie cutters, mixers or any special equipment to make these. Or baking talent (which I lack). My kind of Christmas baking!! Last years’ Gingerbread House aka Leaning Tower of Piso. Only the chimney and 1/8 th of one roof was consumed. Last year I made a Gingerbread House for my family Christmas dinner. Other than the fact that tins of lentils I used to stabilise the walls got trapped inside the house (I forgot they were there when I put the roof on) and that the house went a bit lopsided when I was driving to my mother’s house (hence the ribbon around it), I was rather chuffed with my efforts. Especially given that it was the first time I attempted it. However, after a 12 course Christmas dinner, there was little room left for dessert. So after all my efforts to make the Gingerbread house (I even made a snowman! ), only part of the chimney and about 1/8th of one roof was nibbled at. So I swore I would never make another Gingerbread House again unless I was going somewhere with 50 people! But as Christmas approaches in 2014, I started having nagging thoughts about making something with gingerbread because….well, I just love gingerbread. This is the only time of the year I make it, it sings of Christmas to me. And being the first Christmas with my blog, I wanted to share an edible gift recipe. Something a little different. And that is the story of how the idea of the Gingerbread Boxes and Mason Jars was born. A more sensible size than a giant Gingerbread House that takes an army to consume. Something that is easily transportable, can be packaged up nicely and isn’t difficult to make (because I don’t do difficult!). It took several goes to get this right. 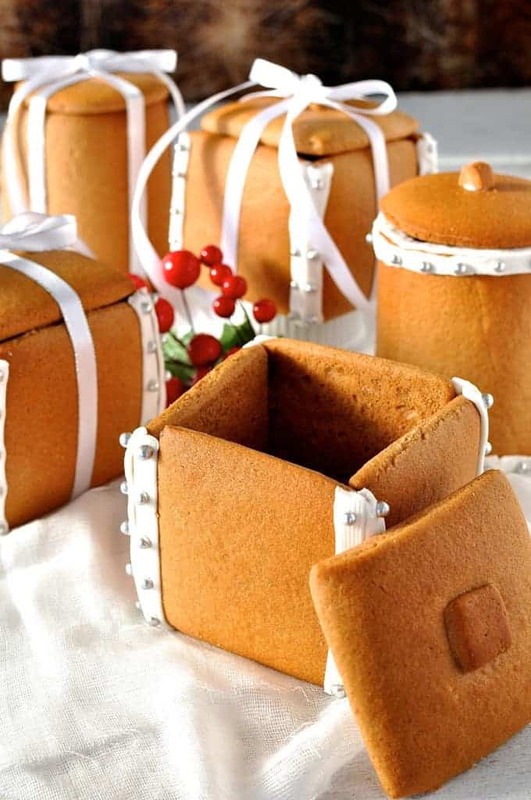 I only found one recipe for Gingerbread Boxes on a commercial recipe site. I won’t get into details but suffice to say it didn’t work. So I decided to make one up myself. Firstly, let me assure you that these are really easy! They take time, but they are not hard. Don’t let the length of the instructions fool you! I jammed 2 recipes into 1 (i.e. the Boxes and Mason Jars) plus it got wordy describing how to cut the dough and construct the boxes. If you aren’t into fiddly, then I recommend making the Mason Jars because they don’t require constructing. All you need is an empty can covered with baking paper (parchment paper). Then wrap it with dough. It sticks perfectly because Gingerbread dough is quite sticky. Then the other step you don’t normally do with gingerbread is to chill it again. This helps the Mason Jar from sliding down while it bakes because it needs to be baked upright. I tried baking it lying on its side but the jar ended up flat on one side which didn’t look so nice! You don’t even need to “glue” the base on. If you use the can to press out rounds, those rounds should just about fit perfectly into the base (if not, just trim it with a knife). And because gingerbread is slightly sticky, the base stays in without the help of icing or melted chocolate. The Boxes are easier to cut out because you just need 8 squares for each box. But they take longer to assemble because you need to “glue” them together using melted chocolate (which I find sets faster and is stronger than Royal Icing). Also because the gingerbread squares puff slightly when baked, you need to do a bit of trimming to make it easy to construct and so the Box stands flat on the table. It’s lengthy to explain in words so I’ve done up a diagram to show you (see recipe below). I think these make a great gift – for Christmas or any occasion! You can fill them with whatever you want. I filled mine with homemade Chocolate Ganache Truffles (psst, I’ve got some tips to make rolling these up really easy instead of looking like you had a chocolate fight!). No cookie cutter, mixer or any other special equipment required to make these. Fill with goodies for a completely edible homemade gift! Tip: The Mason Jars are easier to make because they don't require constructing! This recipe makes either 2 boxes or 2 mason jars. Please note: The gingerbread recipe used in this recipe is specific for this recipe. It is lighter than most gingerbread recipes (less butter, honey instead of molasses or golden syrup) so the Mason Jar doesn't slide down the can while baking (which is what happens if you use a gingerbread recipe with more butter in it). Pour into a large bowl and add the egg. Mix until combined. Sift the remaining Gingerbread ingredients straight into the bowl. Mix until just combined, then use your hands to knead it a few times in the bowl to bring the dough together. (Or turn onto work surface if your bowl isn't large enough). Remove dough from fridge. For ease of handling, cut the dough into 2 pieces. Use a rolling pin to roll out to 3mm / 1/ 10" thickness between two pieces of baking (parchment) paper. See Note 3 for an easy way to do this. Proceed with instructions to make Boxes or Mason Jars. Preheat oven to 180C/350F with one oven shelf in the centre and the other directly below it. Line 2 baking trays with baking paper (parchment paper). Cut out 12 squares from the rolled out dough that are 8cm x 8 cm (3" x 3"). Place onto baking tray. Optional: Cut 2 x small squares to use as the "knob" in the centre of the lid. Place small squares in the centre of 2 squares. Bake for 12 to 15 minutes until golden brown. The top tray will take around 12 minutes, the bottom tray will be closer to 15 minutes (move it to the upper shelf when you take out the first tray). Allow to stand for 5 minutes on the tray then remove onto cooling racks. Once the squares are cool, select 8 squares to be the walls of the boxes and line them up in front of you with the flat side down on the bench (i.e. the side that was on the baking tray). Use a knife to trim the bottom and right side of each square (to make the edges flat - easier to construct). Melt the milk chocolate buttons. Use a knife to spread melted chocolate on the right edge (that you trimmed) of one square (Square A). Hold Square A standing upright so the bottom edge (that you trimmed) is flat on the work surface. Get another square (Square B) and hold it upright so the bottom trimmed edge is on the work surface. Attach the chocolate edge of Square A to the flat side of Square B (i.e. the side that was on the baking tray). Hold for 20 seconds to let the chocolate firm up a bit. On Square B, use a knife to spread melted chocolate on the right edge you trimmed. Then attach that to another square, then repeat until you have constructed the walls of a box. Repeat for other box. While the walls are setting, get two more squares. Trim them with a knife so they are the right size to fit inside the walls - this will be the Base of the box. Spread a little chocolate on the edges of the square then pick up the walls and put it over the Base and push down so the Base fits inside the walls. Use Royal Icing to hide the edges and decorations of choice. I used Silver Sugar Balls. Attach the decorations while the Royal Icing is wet. Line 1 baking tray with baking paper (parchment paper). Press the open end of the can into the dough to cut out 2 rounds. These will be the base. Cut 2 x strips of baking paper that are at least the height of the can and are long enough so it will overlap when you wrap the can. Butter the baking paper then wrap around the cans. Lay the rectangle from step 4 on the dough and use a large knife to cut out the rectangle. Repeat to make two rectangles. Leaving the dough on the baking paper it was rolled out on, place the can on one end of the dough and roll up firmly to cover the can. Make sure it wraps snugly, saggy dough will result in a saggy Mason Jar. Remove parchment paper, trim any excess dough and use your fingers to seal. Repeat with other can. Place the cans on their side on the baking tray, seam side down. Gather up the dough remnants and roll out again. Place one can with the dough wrapped around it upright onto the dough and use a small knife to cut out rounds. Repeat to make 2 rounds. These will be the lids. Place onto baking tray. Place baking tray in the fridge with the cans on their side for 30 minutes. This helps stop the mason jars from sliding down when baking. Preheat oven to 180C/350F. Put the oven shelf in the middle of your oven (note 5). Remove the baking tray from the fridge. If the dough on the cans has sagged slightly, use your hands to press it against the can. Turn the cans upright on the baking tray and place the tray into the oven. Bake for 20 to 25 minutes, until golden brown, turning the tray halfway through (so the mason jar bakes an even colour). Remove from oven and let cool for 5 minutes before transferring to a cooling rack. Once cool, gently pull the can and baking paper out of the Mason Jar. It should slip out fairly easily, if not, just twist it slightly to loosen then pull out. Fit the small circles into the base of the Mason Jar. It might need trimming to fit - be careful not to over trim, you want it to fit snugly. You do not need anything to make it stay in place because the gingerbread is sticky and the base should fit snugly. Decorating is optional. With a ribbon, I don't think any decorations are required. On one, I piped Royal Icing along the bottom, top and rim with Silver Sugar Balls. Use a mixer to beat the egg white until soft peaks form. Gradually add icing sugar, a heaped dessert spoon at a time, making sure it is incorporated before adding the next tablespoon. Transfer the Royal Icing into a piping bag with tip of choice. Use to decorate the Boxes and Mason Jar, as desired. Fill with homemade (or bought) treats of choice. Mine are pictured filled with homemade Chocolate Ganache Truffles. Tie with ribbons to make them pretty! 1. Have patience and make sure the butter mixture is almost at room temperature before adding in the egg. Firstly, if the butter mixture is straight off the stove and you add the egg, you will end up with scrambled eggs in your gingerbread. Secondly, if the butter mixture is still warm when you mix the dough, the dough is really sticky and hard to work with. I have experienced both these problems. 2. Don't skip the step of chilling the dough! I tried it once and the dough is impossible to work with, far too sticky. 3. I find the easiest way to roll out this dough is as follows: Place dough onto baking paper (parchment paper) and use your hands flatten and spread the dough to almost as thin as you want it. The dough is soft so it is easy to do this. Then place another piece of parchment paper on top and roll out to desired thickness. If you try to roll out a thick lump between baking paper then the baking paper crinkles and gets bunched up because it sticks to the dough which you are rolling out. 4. If you cut the dough using a piece of baking paper that is cut to shape to wrap around the can without an overlap, when you roll up the can in the dough, it won't be long enough. I won't go into technicalities, but just trust me, make the rectangle extra long. It's easy to trim excess but a pain to fill the space if you are short. 5. You need the oven shelf to be at a height so when you put the tray in, the top of the mason jars will fit without touching the top of the oven. 6. 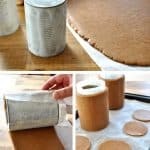 The gingerbread recipe plus the step of chilling the dough again once it is rolled up on the can are specifically to help ensure the Mason Jar maintains its form while baking, instead of sliding down the can (causing the bottom of the Mason Jar to be wider than the top). However, if your Mason Jar does lose its shape while baking, you can balance it out visually by either piping a rim of Royal Icing along the top rim or wrapping a ribbon around the top. Another thing I did was to use leftover dough to make a mug handle which I glued onto the side of the "mug" (using melted chocolates) and I filled the mug with a sachet of hot chocolate powder and marshmallows. That was quite fun too! 7. Nutrition assumes 12 servings (being one Gingerbread Box piece each!). The dough is very dry and not sticking together. Suggestions? Hi. I do so enjoy your recipes. 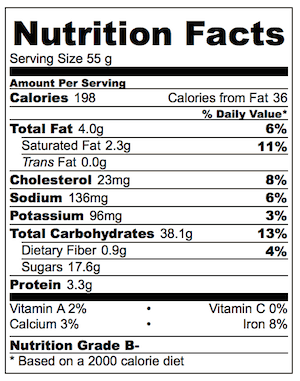 How can I tweak this to make gingerbread cookies? Thanks. Sounds like a wonderful idea! Can this recipe be used to make gingerbread men? Thanks! Love your recipes! I have a question. I live in a very hot climate, would using the royal icing last longer than the chocolate buttons in our 30degree plus weather? 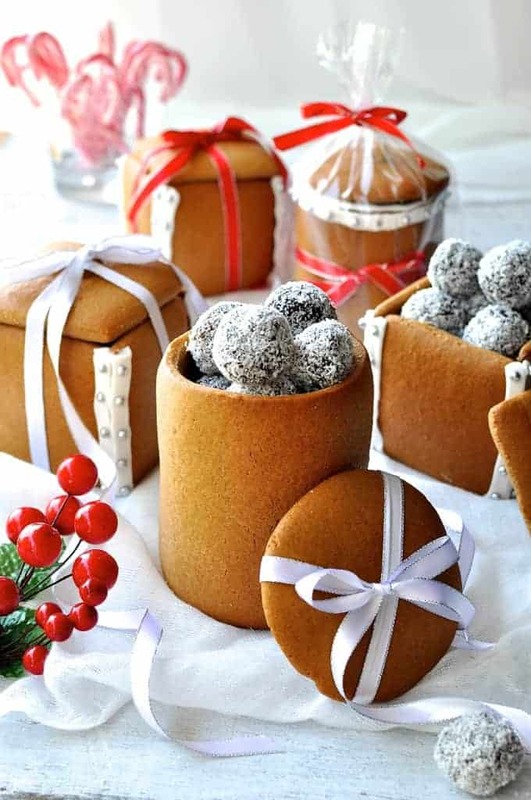 Can I use to make ordinary gingerbread bread biscuits? I’m a big fan of all your recipes. They never fail. I did Thai beef salad last night and it was sensational! I made these because my brother requested gingerbread biscuits for Christmas. I just love that I don’t have to convert or struggle to find ingredients of American recipes. I made this four times, once with honey, another with golden syrup and two with molasses. Everyone loved themolasses version the best but the other two are still delicious! WOULD IT HURT ANYTHING TO MAKE THE SLIGHTEST LITTLE LIP OVER THE CAN WITH THE DOUGH? THEN MAYBE THE DOUGH WOULDN’T BE AS APT TO SLIDE DOWN. Marcia! You GENIUS! I have to try it! Hi! We used this concept for making emerald city from wizard of oz – we “glued” the mason jars on top of one another!! So thank you! I would like to make these egg free: think flax seed meal or other egg replacer will work? Thank you so kindly!! Hi, I have tried the Mason jars twice but both times they have slipped halfway down the can! Both times I have chilled the dough both before and after putting it around the can. Is there anything else I could be doing wrong?! I’m trying it again this evening so if you have a suggestion, that would be great! I’m wondering if maybe my oven was too hot or too cool, if perhaps I rolled out dough too thickly or not tight enough around can? If you haven’t all but given up on this project, wrap the dough around the jar then wrap the dough in foil. You may get some wrinkles in your final cookie depending how you get the foil on, but it should be standing…and you can just decorate over any wrinkles you don’t like! Hi Emily, I am so sorry to hear that 🙁 Do you wrap the dough on tightly?? I am going to try to make a train (the flying scotsman!) for my nephew as a christmas present by adapting your ingenious mason jar recipe. Can you tell me, would it matter if I subbed honey for molasses (so the flavour was a little darker, if you know what I mean?!). 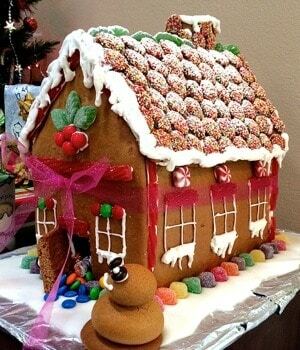 And would this kind of dough work for other gingerbread constructions do you think? (such as making train carriages! – I’ll use royal icing to stick things together). I’m aware that you adapted this recipe for the mason jars – but I assume that the end product is still good to eat (- not too dry?)? (Over at simply recipes she notes that the recipe is for SHOW rather than eating – which seems such a shame given how yummy ginger bread is!). Apologies for this long message. Thanks Nagi! If it’s not a total flop (it’s my first ever ginger bread construction) I’ll send on a pic. 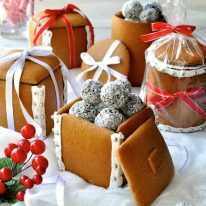 Looks yummy and I am gona make these for Christmas. The only thing, how would I store these so they will not go soft before the time, I stay in a humid place (S.A. Durban). Any idea? Hey! 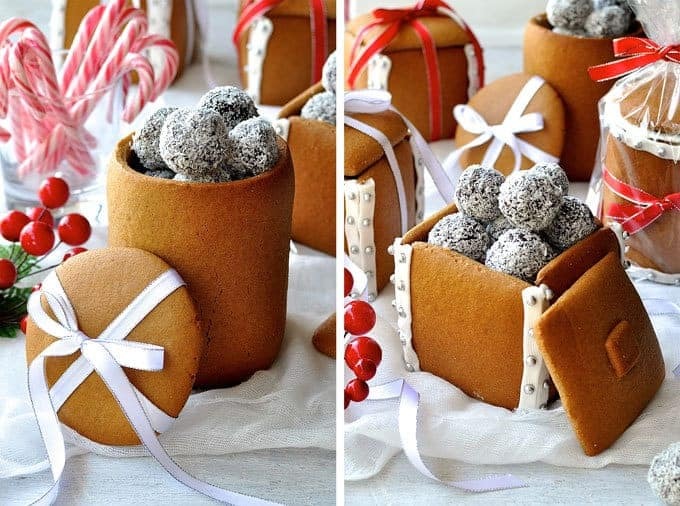 Could you use a sugar cookie mix instead of ginger bread to make the jars? Thanks a lot for sharing this with us!!!! Hello ! Love the idea , once made how long will they last in cool dry place ? Hi, I love this gingerbread recipe. I’ve used it as a cookie recipe and it was the best!I have just one question: Do you know how long the dough can be refrigerated (and Frozen)before it starts to go bad? This is so cute. I love it! I’m thinking of trying to make this but i don’t have allspice. What affect is there if i don’t add the allspice and will it still turn out alright? Hi Mariana! yes it is the same as baking soda. I should have clarified, thanks for the question! Gingerbread houses seem to last forever as long as it was baked long enough before putting together. The gingerbread dries out more with being set out on display. You can actually cover it after the holidays and keep it for the next year; store in a cool, dry place – even a tote will work. Once put together with royal icing, it’s like fruitcake. 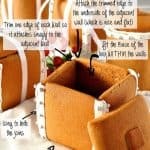 LOL Some of the gingerbread cookie mixes make great houses, too, so you can avoid putting ingredients together for dough making and get in to the fun quicker.